Mr. Paul Kanjanapas, Managing Director of IMPACT Exhibition Management Co., Ltd., has revealed that “The overall growth of IMPACT Speed Park since April 2017 to April 2018 has generated a revenue of 19.98 million Baht. Comparing the second and third quarter of this year (April - September 2018) to the same period of the previous year, there is a significant growth of 62%, due to the increase of tourist patronage, especially international tourists whereby a remarkable rise of 94% or almost one fold was seen, simultaneously among female tourists there was an outstanding increase of 65%. “IMPACT Speed Park has been invariably trusted by both local and international giants as a venue for social gatherings, parties and product launches. 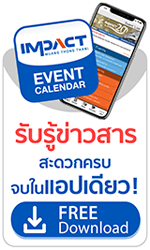 A total of 33 events were held at the IMPACT Speed Park and IMPACT Lakefront from January to October 2018, of which notable events were the Singha Junior Kart Challenge 2018, the premier of Ferrari 812, Nissan Thank You Party, GoPro HERO 7 Experience and the BMW event,” Mr. Paul added. ““IMPACT has an objective and strategic plan that aims to develop IMPACT Speed Park to become a preferred tourist destination of Thailand among both local and international tourists, generating income for the country through tourism adhering to the government policies. Throughout 2018, IMPACT Speed Park has constantly invested in the expansion of its track and unveiling the new gasoline karts that brings an exciting new dimension to leisure karting. Gaining widespread popularity among Hong Kong tourists, the Tourism Authority of Thailand (TAT) Hong Kong Headquarters has then continuously promoted the IMPACT Speed Park. As a result, Hong Kong tourists became the second largest customer after Thai tourists. As for 2019, we intent to increase the number of tourist patronage by twice as much as compared to 2018. Celebrating the 2nd anniversary of IMPACT Speed Park on December 1, 2018, we would like to show our appreciation to our customers by kicking off “Free Dining Vouchers” promotion, granting each customer who purchases 3 karting sessions a special privilege of 300 Baht that is redeemable at the 3 restaurants at IMPACT Lakefront, each with their own uniqueness; Uwajima Japanese restaurant, Breeze Café & Bar and Isan Jim Joom. Furthermore, two packages specially tailored for parties and social gatherings, namely “Drive & Dine” and “Let’s Get Party” are also available,” Mr. Paul concluded.